The following post contains pervasive geek content and imagery. Reader discretion is advised. Today marks the 10 year anniversary of the release of Star Wars: Episode I - The Phantom Menace. Has it really been a whole decade? That makes me feel old. Commemoration of this occasion calls for no less than two blog posts—one dedicated to the hype, and the other to the film, as these are two very different things. So who remembers 1999? Seeing this film was a major cultural event. It was the perfect storm of fan hunger and media coverage just before the dawn of the online ticket age. My Episode I experience is one of the most memorable of my life. It's one of those stories I'll tell my kids, and they'll tell me how big of a geek I was (or still am). I had always been a big Star Wars fan growing up, and when I reached high school, I found a group of friends that loved these movies as much as I did. Star Wars also happened to be enjoying a bit of a resurgence at the time thanks to a blossoming expanded universe and a new line of toys and merchandise on store shelves. With talk of how much collectors were willing to pay for the original series of Star Wars toys, several of my friends and I enthusiastically spent the paychecks of our crummy teenage jobs to start collections of our own. Unfortunately, every other fan that wished they hadn't destroyed their old toys had the same idea, so that pretty much negated the value of the new series as eventual collector's items. I kept up with the first few waves of action figures and ships, but as the toy line expanded further and further, I wisely gave up the dream. This collection now resides in a pair of boxes at the very back of the storage room under our stairs. Kristen has a habit of bringing this up every time we are doing Spring cleaning for some reason. 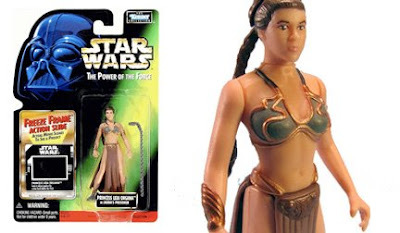 Star Wars toys were officially no longer being made for kids when the first "Princess Leia in Steel Bikini" action figure debuted. This Star Wars renaissance culminated with the release of the Special Editions in the Spring of 1997. I find it quite fascinating to look back on this time from a marketing standpoint, realizing that it was all part of a well-orchestrated strategy to re-establish the series in the minds of consumers—the precursor for a new set of films. Soon enough, official word started to emerge concerning the long rumored second trilogy. First came tidbits about casting. Next, its peculiar title, The Phantom Menace, was revealed. By the Fall of 1998, the hype machine really started to roll with the debut of the first teaser poster and trailer. When the theatrical trailer followed a few months later, I recorded it off TV and watched it so many times that I unwittingly pieced together a vital plot point (Qui-Gon's death). 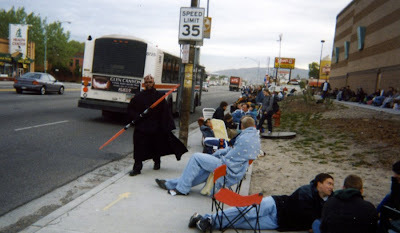 I finished up my freshman year at Utah State in early May, returning home with the release of The Phantom Menace only a few agonizing weeks away. By now, only me and two remaining friends, Spencer and Fonz, had yet to leave on LDS missions. My departure date wasn't until July 7th, but poor Fonz had the misfortunate of being called to report to the MTC on May 19th, the very day the movie was coming out. And then there were two. At the time, the Century 16 in Salt Lake was the only local theater to feature THX certified picture and sound, so naturally that is where geeks like us wanted to experience the film for the first time. Spencer had heard the Century was going to be preselling tickets a week in advance, so the evening before they went on sale, we decided to head down to the theater just to check out the situation and maybe ask a few questions. Much to our surprise, we saw that a line had already started to form in the east parking lot. One fan was dressed in complete Darth Maul attire and makeup, while another pair were adorned in Jedi robes, hard at work choreographing an elaborate lightsaber duel. We saw this fan at the theater again later in the summer, still rocking the full costume. That's dedication. Misguided? Definitely. After exchanging glances, we knew what we had to do. We quickly drove home to grab sleeping bags, camp chairs, and other supplies. Our next stop was Albertsons to stock up on food. If my memory serves me correctly, we filled our shopping cart with a bag of tortilla chips, a jar of salsa con queso, a 12 pack of Pepsi, a 12 pack of Mountain Dew, a box of Cinnamon Toast Crunch, a half gallon of milk, a box of raspberry filled powdered donuts, a box of fruit snacks called Jar Jar Glitter Rolls, and last but not least, a helium-filled Darth Maul balloon. Spencer's mom graciously footed the bill. By the time we made it back to the theater around 8:00 pm, the line now stretched once across the parking lot and wrapped halfway back—not a bad position to be. 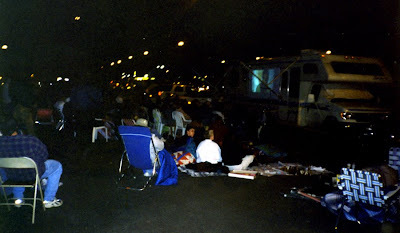 We hunkered down for the night, basking in the palpable buzz of the growing crowd, and catching occasional glimpses of the Original Trilogy being projected on the side of someone's RV. We attempted to get some sleep, but all the caffeine coursing through our veins and noise from the crowd made it next to impossible. "That there is an RV." By morning, the line now went back and forth across the parking lot 7 or 8 times. We had a quick breakfast and packed up most of our supplies. Around 7:00 am, a handful of overwhelmed theater workers with megaphones came over to instruct us on what was going to happen next. Tickets were going on sale at 1:00 pm, and in the meantime, we had to move the line from the parking lot over to the ticket office. One by one, they gave us small numbered tickets to preserve everyone's place in line, but the crowd quickly bunched up near the front as people started to cut in line. By the time we got our numbered tickets we were in the 400s, well back from where we had started. Still, the rumored number of people said to be there was somewhere around 2000, so it could have been worse. As the line reformed in front of the ticket office, it wrapped all the way around the theater and back across part of the parking lot. We were situated against the east side of the theater—the State Street side. This meant that every 30 seconds or so, a passing car would honk at us. If running on limited sleep were you, with a belly full of raspberry filled salsa con queso donuts, look as good you would not, hmm? Once we were settled, we got in on a round of Star Wars Trivial Pursuit with some people next to us. In the midst of our game, a reporter and cameraman from KSL News were walking up and down the line looking for some interesting fans to feature in their story, and Star Wars Trivial Pursuit was just the hook they were looking for. So a group of about six of us got to be in the background as she covered the event. To close out the segment, she asked us what had to be the easiest questions in the game (which she rehearsed with us before going on camera), including "What color is Darth Vader's lightsaber?" and "Who said 'All his life has he looked away... to the future... to the horizon?'" For the latter, she used the worst Yoda impersonation I have ever heard. The kid whose head appears in the bottom of this photo was wearing a t-shirt that said "Can't sleep, clowns will eat me..." over and over. What can I say, it was a very memorable shirt. After that bit of excitement, the morning began to drag. 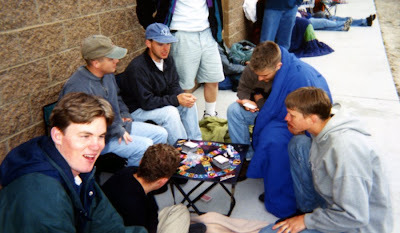 We eventually tired of Star Wars Trivial Pursuit, and tickets still hadn't even gone on sale yet. Plus, all the junk we had eaten was starting to catch up to us. We weren't allowed to use the theater bathrooms, so I ventured back over to the east parking lot to use one of the two port-o-potties that had been provided. Let me tell you, sharing two port-o-potties with 2000+ people was not pretty. Every moment behind that plastic door was spent imagining the horror of getting tipped over while still inside, so I was in and out of there like lightning. 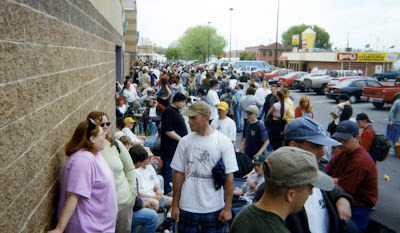 When 1:00 finally rolled around the line started moving, albeit very slowly because the theater only had one ticket booth dedicated to selling Star Wars tickets. Did I mention that the Century 16 staff was totally unprepared for the geek tsunami that hit them? This isn't actually the ticket line. It's the line for the port-o-potties. The afternoon dragged by as we slowly made our way around the building, inching ever closer to the front of the line. By 5:30 we had reached the home stretch. Thankfully, they finally decided to open up more ticket booths, and the line really started to move. By 6:00 we held tickets in our hands, approximately 22 hours after we started our quest. Now we just had to wait another week for the movie to actually come out. Crap. I don't remember it being near as exciting. My story for getting tickets was something like this - ask Dave to get me tickets. Of course, it could have been someone else that I asked to get me tickets. I don't really remember. Yes I seem to remember picking up a few tickets for you and maybe some of your friends. You're welcome. I missed this whole phenomenon, since I was already on my mission. Although, I think I may have been in line too, had I been in the country. I've always been the type to get swept up in the hype machine.